The heat of the afternoon was tempered by a gentle breeze as we came across 8 Little Egrets and a Kingfisher put in a brief but brilliant appearance with flash of dazzling azure as it landed on a rock in front of us before flying across the river and reappearing a few minutes later. More azure blue flashed towards the extremity of Blue-tailed Damselflies and a Red Admiral took a real liking to Verna, flying around for a few seconds before settling on her arm 🙂 As the evening progressed the light suddenly switched from dazzling and contrasty to sublimely beautiful. A small Starling murmuration hinted at the spectacle we’ll be enjoying by the winter, 2 Roe Deer were in deep vegetation, a Kestrel was flitting from tree to tree along the roadside ahead of the car and a Barn Owl flew over the reeds carrying a Short-tailed Field Vole as Common Swift, Barn Swallow, House Martin and Sand Martin plundered the dense clouds of insects rising above the ethereal mist drifting over the water. We met up in Newbiggin and set off on our search. Our first site had plenty of birds but no Otters, so we headed on to the site where I thought it would be good to be at dusk. A Kingfisher provided a splash of iridescent brilliance in the fading light of mid-afternoon and a group of Teal, Goldeneye, Mallard and Tufted Duck drifting away from a reedbed caught my attention. Scanning the reed edge with our telescope revealed a dark shape, twisting and turning but mainly hidden from view in the reeds. It soon vanished, but the ducks were still wary, so I continued scanning that area. 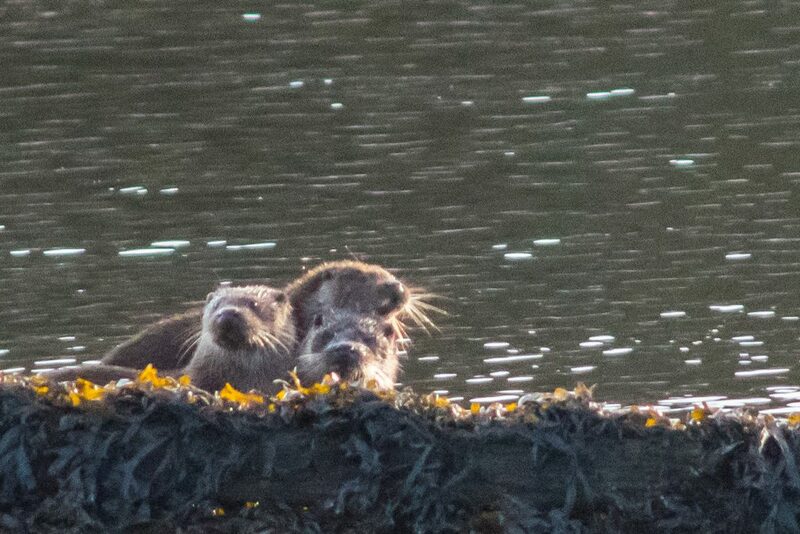 After 20mins the Otter finally came out into open water and each time it dropped out of sight we tracked it by the current location of agitated wildfowl 🙂 It was clearly making it’s way towards us and, after a few minutes without a sighting, it was suddenly running along the bank right in front of us! It quickly disappeared into another reedbed, triggering the begging calls of it’s cubs, before reappearing in the water with one cub, as two more continued calling, drowning out the calls of Snipe and Water Rail 🙂 As a Starling murmuration began to develop, the calls of Whooper Swan and Pink-footed Goose cut through the gloom as they arrived to roost and eventually it was too dark to see anything out on the water. Arriving at our first location, Claire asked if she’d remembered correctly how to search for Otters, and started scanning an area of water that was noticeably devoid of ducks…then almost immediately answered her own question with another one “what’s this in front of me? It’s an Otter” 🙂 We watched the cub as it fed on small fish and then it caught a much larger one which it took into the reeds. Through the telescope we could see the dark shape of the Otter wriggling among the reeds, as a second cub came into view and started feeding. Scattering Goldeneye, Mallard, Long-tailed Duck, Tufted Duck, Teal, Wigeon and Little Grebe as it continued in it’s relentless search for food we lost sight of it for a little while before it reappeared and made it’s way towards us before finally vanishing behind the reeds. By now the rain was hammering down and we headed to our second site for the afternoon. Under a leaden grey sky, with a chill wind and persistent rain we watched until it was too dark too see. Grey Heron and Cormorant had been and gone and a Kingfisher dived repeatedly into the water from the bankside, silhouetted against the last meagre scraps of daylight.